We woke up yesterday to a very pregnant cow who looked ready to bust. Needless to say, by the afternoon she was ready for calving. We went out to check on her and discovered her bag of waters was out and about to break. Of course we waited...and waited..and waited. Finally we had a nice healthy calf about 6:30, just after dark. It was too dark for pictures or videos, so I snapped some shots of the little girl this morning. She IS a HEIFER!!!! This makes me very happy, as she will grow up to be a nice family milking cow one day. She is very tiny but healthy and active. She has been nursing well and gets around like a pro. The kids came out with me this morning to check on Lucy and the new calf. The kids all agreed to name her Annabelle since she was born in December. They got the name from another favorite baby calf who starts in one of their favorite Christmas movies. 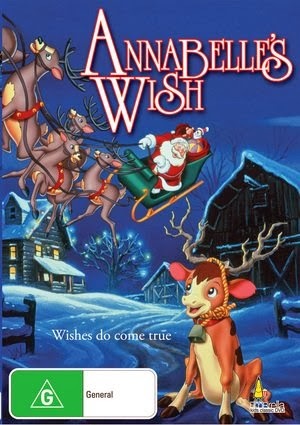 If you are looking for a sweet Christmas movie, this one is available on Amazon, and it really is a favorite here. So since we were all in the Christmas spirit here, Indiana decided to dress up our other calves, Stella and Ivy. She decided they need a nice big bow on their halters. Surprisingly, they are still intact this morning. They really look cute with their fuzzy winter coats. Although the weather is quite warm today, it was quite cold last week and cold weather is coming back for the weekend. So, tomorrow I will introduce a fabulous activity book and a giveaway just in time for Christmas!!!! Be sure to check back in because you do NOT want to miss out on this one! She. Is. Precious. I can't wait to meet her. So exciting!!! Aw, she's beautiful! You're going to have a whole herd of Jersey cows soon. Oh, my goodness! She is so stinkin' cute! Love the name, too. That was a favorite Christmas movie around here for many years.